Make sales reporting a breeze with our sales report template. You can keep on top of your sales activity with customizable daily sales reports, weekly reports, monthly sales reports, and more! We get it. Crunching sales numbers and tracking your sales performance are an important tasks but they can be time consuming. Why make it hard for you or your sales team? Use DashThis to quickly and easily create your sales reports so you can spend more time on marketing campaigns and sales operations. Our sales report templates are fully customizable. You can choose the time frame for your sales reports and track your key KPIs. There are a lot of factors that go into successful sales efforts. Our custom sales report templates let you choose the KPIs you want to track. Best of all, you can import data from a bunch of different sources so you won't have to manually enter the numbers yourself. Want to make sure your revenues are on track? 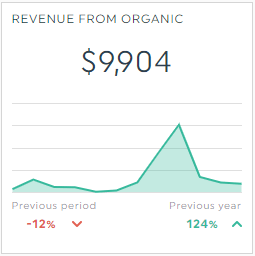 We've got a widget for that: it will show you the total revenue from your sales so you'll easily be able to see exactly how much you're pulling in. Keep on top of the number of sales using our transactions widget, which will show you the total number of transactions on your website or ecommerce site. Use this data to spot consumer trends and gauge the success of your online marketing efforts. The product sales widget will give you a performance report of sales by product so you can track how all your products are selling, see what your top sellers are and learn which products might need to be pushed a bit more. This widget will give you a breakdown of how many visitors to your site turn into paying customs and where your customers are coming from so you can best allocate your marketing budget and increase sales. Try out a free sales report template and see some sales report examples with your own data! Generating custom sales analysis reports is as easy as 1-2-3. All you need is an email address and a password. Plug in your data sources - we support everything from Google Analytics to SEMrush. Choose the ecommerce dashboard template from the dropdown menu. Get your different types of sales data in one convenient report. Automate your sales reporting process with DashThis! Forget about manually plugging numbers into Excel. You can customize your sales report template so it automatically pulls the numbers, crunches them, and visualizes the data for your. How good is that! Get all your sales representatives on board. You can invite as many users as you want so your entire sales team can have access to your sales and marketing data and reports. Once your reporting tools are connected, you can generate reports and automatically send them to whoever needs to see them. It's as simple as creating a mailing list. Add your own font, logos or a custom URL to your clients' reports. You can choose the type of report you want (daily, weekly, monthly or yearly time periods) so you can keep a close eye on your sales or track long-term trends. Keep a close eye on your product sales using a daily sales performance report. Generate weekly sales reports in no time at all. Our monthly reports will help you spot developing sales trends so you can optimize your sales strategy. Take the hassle out of year-end sales reporting with our yearly sales report template. Present your client's website data in one easy to generate report. 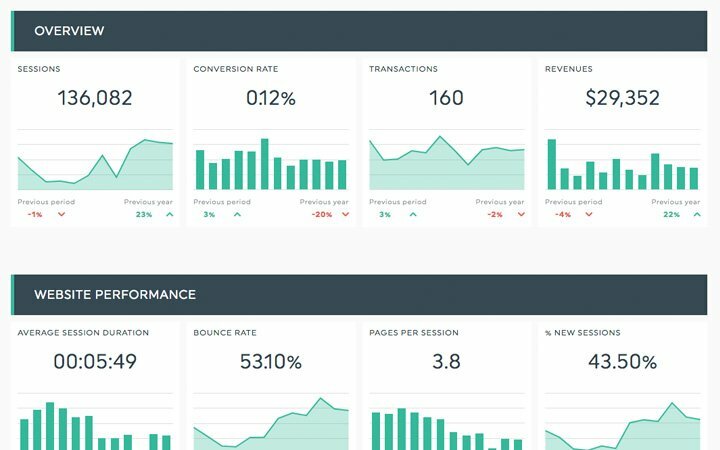 Keep a handle on digital marketing KPIs in one convenient report. 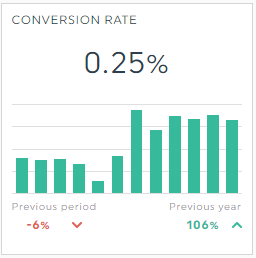 Track your email marketing efforts using our email report template.